I’m always looking for games and toys that my two boys can play with together. At just over two years apart in their ages it can be a challenge. It’s tough to find just the right activity that interests and engages both of them. When I read about the I-Mat from Creative Baby Inc., I knew it had a great shot at hooking both of my boys, and I was right! 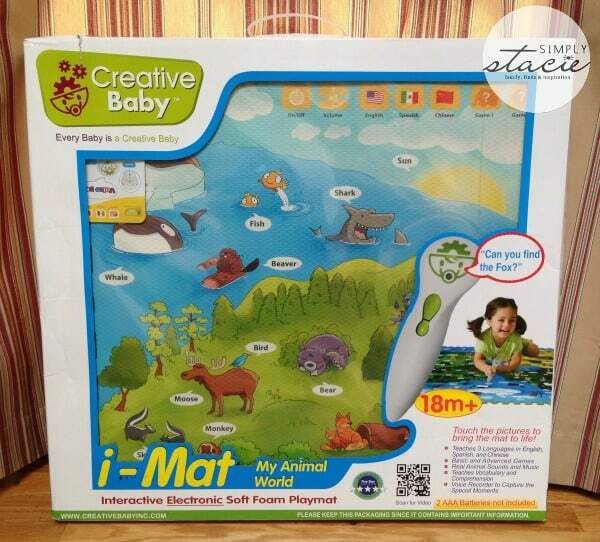 We received an I-Mat My Animal World Set from Creative Baby Inc. for review. It included four large and colorful interlocking foam floor mats and a voice pen. All I needed was 2 AAA batteries and we were set to play! 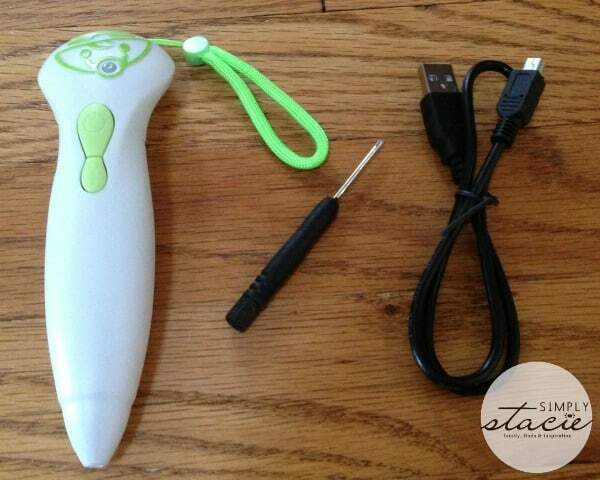 The voice pen interacts with the mat and once we chose our language – of which there are three to choose from – and game level, the pen asked my boys to identify animals by both name and sound. Once they found the animal they were looking for, they pressed the pen to the name of the animal on the mat and were told by the pen whether or not they were right. 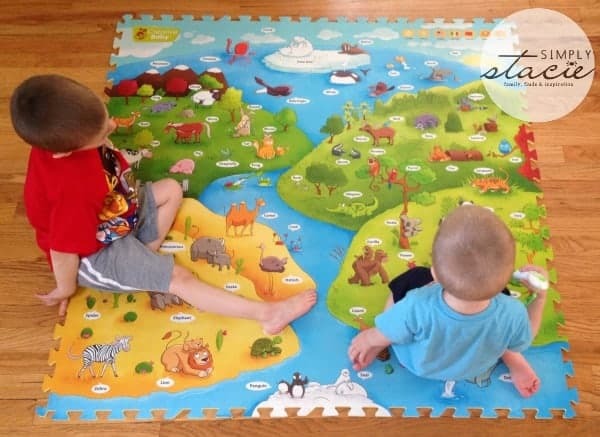 The foam mats are lightweight, yet durable, and both of my boys were comfortable moving around on them as they tried to identify the animals as prompted by the voice pen. 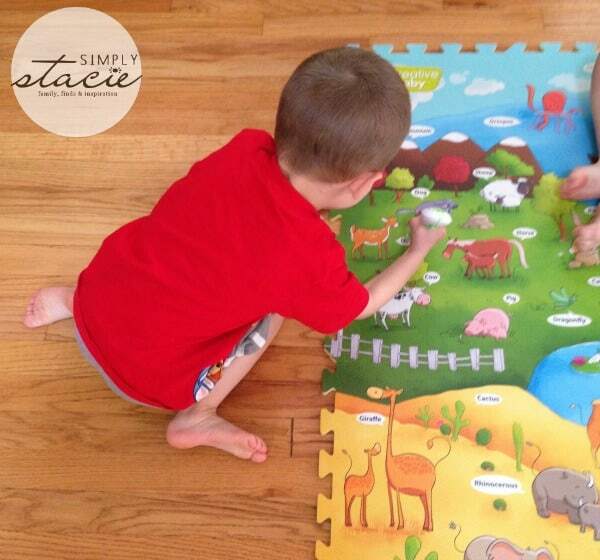 My older son loved being able to help his little brother find the different animals on the mat, and my little guy loved being able to control the pen. They had a blast playing together and I loved watching them have fun while learning to identify different animals. One great feature of this system is that along with the identifying games you can play, there’s also a non-game feature that allows you to press on any animal to learn their names and sounds, which is great for my two year old. With all the fun my boys had with this, I’m excited that new themes are coming soon and that we’ll be able to download the new sound files onto our pen to play! The set I received sells for $79.99 on the Creative Baby Inc. site, with free shipping for a limited time. It is recommended for ages 18 months and up. Creative Baby Inc. believes that stimulating children’s minds through fun and engaging activities is the first step in unlocking their creative potential. There mission is to create unique products that help cultivate a true love of play in children. Their products are designed to excite, entertain, challenge, and delight kids and parents alike! To learn more about Creative Baby Inc., visit their website. That they offer another mat called under the sea! they will gladly accept any return for unused merchandise that is returned within 30 days from the date of purchase. I like the under the sea mat. I like the I-MAT™ UNDER THE SEA !!! 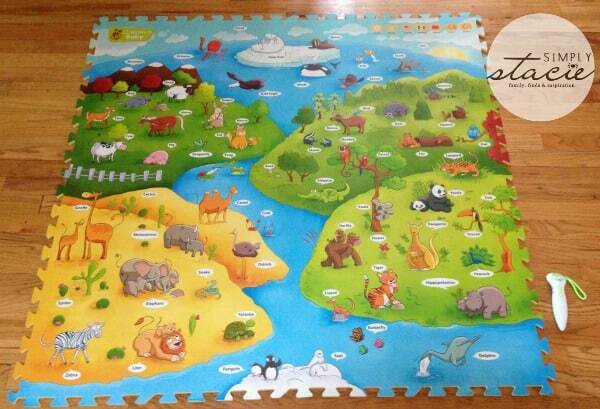 I love that this toy is going to grow with Carter and teach him while he is playing – so cool! The under the sea I mat is definitely required for the new baby entering our family in may! I learned that this imat is in English, Spanish and Chinese.